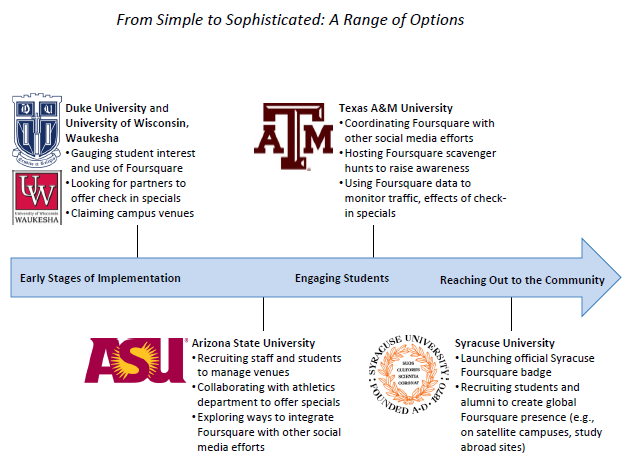 Once upon a time realizing university officials really wanted to know where students were congregating and what they were doing together had an ominous ring, but that's all changed in the super-connected, GPS-tracked world of today's social media. Internet connectivity no longer means checking in from the vague no-man's-land of cyberspace: with the smartphones almost everyone now has (at least the Gen Y set), you are constantly locatable in real space through the geo-locator technology built into your phone. This geo-social component of social networking offers new possibilities for interacting with places as well as people, and leaving a market-opportunity-rich breadcrumb trail while you're at it. The goal of these universities that are using geo-social networking tools is, somewhat ironically, to get students to look up from their handheld devices and interact more productively in the physical world of the campus and its environs. To incentivize exploration of new venues and activities FourSquare makes going there into a game where participants earn points, badges, and discounts. Of course, going to that guest lecture or art show will have the added bonus of creating a more cultured and informed student body, and going to the rec center four times in a week will make for healthier bodies. The game is a carrot, admittedly, but if it works to achieve the larger goals of student affairs managers and event planners, maybe it's worth the investment in getting on board. Could a geo-social media platform like this one have a use for businesses engaging with researchers on university campuses? It's unlikely that many PIs are collecting badges on FourSquare in their spare time, but graduate students and lab assistants? What if a major laboratory equipment tradeshow exposition was going on in the student union ballroom and it was also a registered venue on the campus' FourSquare site? Attendees could not only get door prizes and free edibles but could accrue points for getting their friends and lab mates to visit the event and broadcast their own presence there. They would have a forum for commenting on specific tables ("Don't miss the display at #22," "Excellent goodie bag at #7," or "The seminar at 2:00 looks like a fit with our lab project"). Some of these promotional incentives are already a part of the premium tradeshow marketing effort and others would be newly-possible. The assumption that only younger, non-decision-making students would utilize the geo-social platform may not play out in the long run, either. These are the people who will be tomorrow's researchers, after all. And though the Queen of England does not tweet (that we know of), there aren't many other holdouts against the lure of social networking. That a new technology will be used if enough other people are using it is a given. How it will be used depends on those who get in early and shape its future. Q: Would you be interested in seeing geo-social media integrated into the research faire expo environment? What social media tools does your company or lab currently use? This Science Market Update blog series is brought to you by Biotechnology Calendar Inc., an 18-year veteran in the marketing and tradeshow industry for the life sciences. With events held across the country at major research university campuses, Biotechnology Calendar, Inc. brings together researchers and laboratory equipment suppliers in a productive, professional environment where they can share knowledge and information about the technologies that allow scientists to advance their work. Visit our website for information about upcoming shows in your area.